I've missed the girls, SO much. if you are a long time reader you know that my depression and anxiety make it really difficult for me to be apart from them, so being in hospital and not being able to put them to bed at night, hasn't been the easiest thing for me, I've cried way more than I care to admit about it, and begged the doctors in charge of my care to let me go home, on the promise I would rest - but they weren't having none of it. Luckily, I'm kind of back on my feet, for the most part, and I've been put onto a low-fat diet, to try and ease some of the symptoms and avoid any more flare-ups before my surgery. Anyway, less about that and more about my goals for 2019, I'm not one of those people who set new years resolutions, but as I get older and the girls grow more, there are definitely things that I want to work on and improve, so I thought that I would share those with you. Be healthier and eat better. I kind of don't have a choice with this one, as I mentioned already I'm on a low-fat diet for medical reasons, meaning all of the food I love - cheese especially is like a no go for me right now, as it'll just end up putting me back in the hospital. Being in the hospital so much over the Christmas and new year period as made me even more appreciative of good health, something that I think we all just take for granted until something happens to make us notice. I want to be around for my girls growing up, and be able to run around with them, and do the things they want to do. With that in mind, I'm really trying to focus on changing our eating habits. I'm not on any weight loss diets or attending any groups. I'm just making changes to our diets and working on being a healthier version of myself - with the odd slice of pizza when my stomach allows. This low-fat diet isn't going to be a temporary thing, its something that I am going to have to be on for the foreseeable future. I know that being patient is easier said than done, its hard to wait or keep telling your child the same thing 40 times a day, but I really want to make more of an effort to actually keep calm, and not losing my patients when my girls are in a defiant mood - which honestly is most of the time as they are both extremely stubborn (they get that from me so I can't really complain too much). Instead of rushing through the day to day things, I want to make more of an effort to slow down and enjoy the moment. I feel as if we seem to jump from one thing to another lately, because it's extremely hard to do things with two children who both want to do different things, but I want to try and take more time to enjoy their little ways, and there differences because lets face it, they grow up way to fast. Now this one is going to surprise most people, I do take lots of pictures but usually, they are on my phone and not my camera. When I do get my camera out I have instant regret that I don't use it more, so it's something that I really want to try and do more. I love taking pictures, and experimenting when editing back my pictures, I just find that I forget my camera, or get too embarrassed to get it out when we are in public, which is something I want to work on this year - fingers crossed for more photography type posts. Technology is amazing, but its also so distracting. I'm one of those people who seems to have my phone on me at all times, even if its just in my pocket. I'm not on it 24/7 but I am on it more than I'd like to be. I want to take time to be more in the moment and put my phone away. I've already started working on this one and instead of having it on me, I've started to just leave it on the side, which helps massively, because it takes away the temptation of pulling your phone out and pointlessly scrolling through social media. I love nothing more than being outside, exploring a new country park with the girls. They both love being outside too. I do think that we haven't done it enough lately though, with the weather being a bit naff, we have tended to stay inside more. I really want to explore new country parks this year, and visit places that we haven't before. Like most people in life, I'm my own biggest critic. 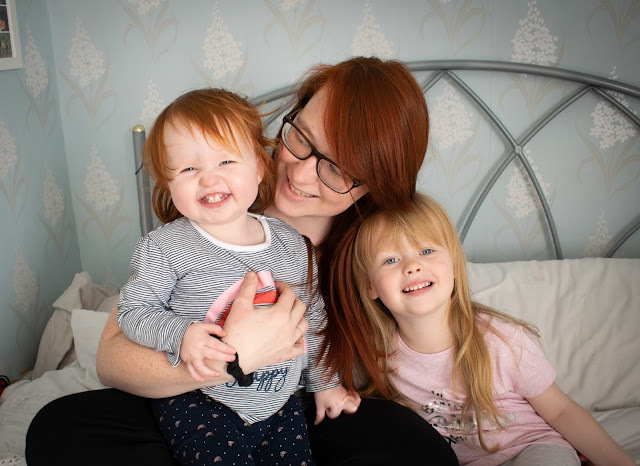 I haven't been comfortable in my own skin for as long as I can remember, and constantly put myself down, as a mama with two beautiful girls, I have become really mindful of how that can affect them as they grow. I don't want them to have a lack of self-confidence like I do. I'm sure everyone has something that they don't like about there body, and rather than constantly looking for the negatives and things I'm unhappy about, I want to try and focus on the things I do like.